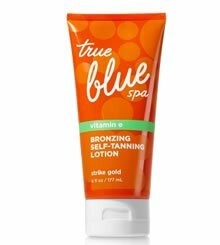 Comprehensive review of Bath and Body Works Self Tanning Lotion. See what real experts and actual users have to say about this self tanning product. It’s not very often I give a product 1 out of 5 stars. But I had to this time, there were so many things I didn’t like about Bath and Body Works Self Tanning Lotion. First of all, the product is an absolute mess, glitter gets everywhere! I’ve never seen a product have so much glitter in it. There’s also a very dark guide in it, which also adds to the messiness of the product. The color is very orange and unnatural looking. You can definitely tell I used a self tanner. The only thing I liked about this self tanner is the smell. It’s very fruity, but it’s also very strong. So in my opinion, this is one of the worst self tanners out there. Bath and Body Works Self Tanning Lotion is supposed to be a “lotion” but it feels more like a gel to me. It’s very slick and gel-like. It comes out a dark brown color and has a ton of glitter in it. This self tanner has a dark guide in it, so make sure you wear gloves while applying it. I didn’t and it stained my palms and fingers. There is also glitter in this product, so if it gets anywhere it’s a major pain to clean up. When I woke up the next morning, my entire bed and bathroom were all covered in glitter, it was SO annoying and extremely messy. This self tanner took about 35-40 minutes to dry completely. That’s too long in my opinion. I felt wet while it was drying. And the worst part, I sat down and glitter got everywhere! The smell is the only thing I liked about this product. It smells like a lot of Bath and Body Works products do, sweet and fruity. It’s a pretty strong smell though, so some of you may not like it. I could smell a little DHA on my skin the next day, ew. I was thankful it went away after showering the product (and all the glitter) off. The color I got from Bath and Body Works Self Tanning Lotion was really orange. Someone even commented on how orange I looked (talk about embarrassing!). The color was probably a medium shade, but it wasn’t natural looking at all. It was also pretty splotchy. Needless to say, I wasn’t a fan of the color I got from this one. It lasted about 2 days before it drastically faded. And with this one, I’m not complaining. Normally I like my self tanner to last at least 5 days, but with this one I was happy it faded quickly because I didn’t like the color at all. As it faded, it got pretty streaky as well. Definitely not. Men, stay away from this one! This self tanner is $15.00 for a 6 oz bottle. Overall, $2.50 is pretty affordable for a self tanner, but I wouldn’t pay that for this one. To buy Bath and Body Works Self Tanning Lotion, Click Here. Application Messy, glitter gets everywhere! Drying Time 35- 40 minutes, too long! Smell (Before) Smells nice, very strong and fruity. Smell (After) I smelled a little DHA the next day. Color Produced Produced a medium, orange shade. Splotchy and very unnatural. How Long It Lasts Lasted about 2 days before it faded drastically. OK For Men? No, men won’t like all the glitter and the orange color. Price $15.00 for a 6 Oz bottle. That’s $2.50 an ounce, which is very affordable.